Unique pastor appreciation plaque based on this text: Your light shines before others. You have touched the lives of so many; thank you for your dedicated service in His name.Your ministry is a unique expression of God's grace. 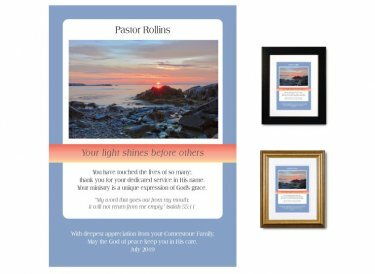 You'll personalize it with the name of your pastor, priest or lay minister - then add your own special message (where you see the white text at the bottom of the example design).